I'll be honest, I haven't celebrated Halloween for a solid six years. I remember that year because I was twelve years old and I was a ladybug for Halloween. Though I love the concept of it: The parties, parades and trick or treating, I've never gotten a chance to fully enjoy myself on such a festive and somewhat horrifying holiday mainly because Halloween either took place on a school night or my mom was really worried about my well-being once the sun set. This year I haven't fully decided what I wanted to do or even go as but it doesn't hurt to share what I had in mind does it? Keep in mind that the celebrities I've picked out are not in anyway suppose to reflect your style... I was going for something outside of my comfort zone and encourage you to do so as well. 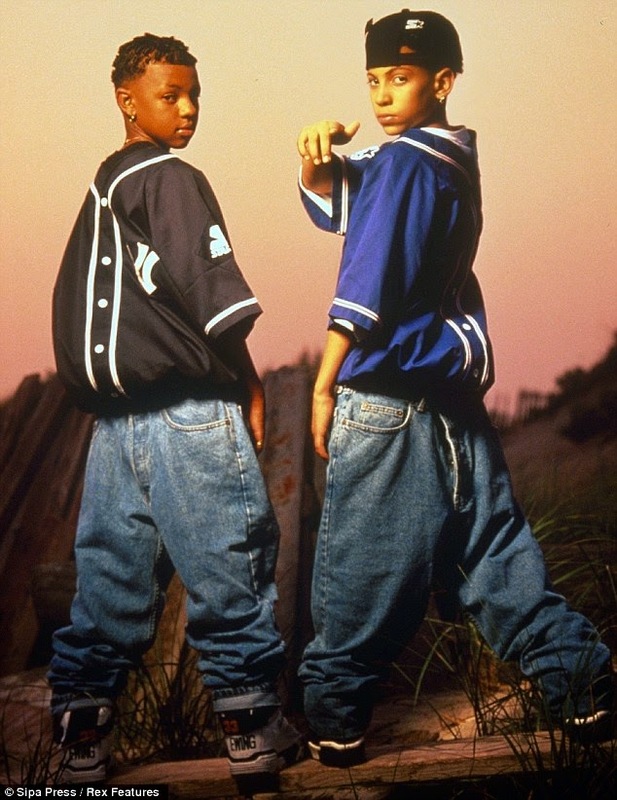 I"m definitely not going to act like I know another song from Kriss Kross other than "jump", but I'll tell you their style was fun yet different... Kids wearing baggy clothes backwards? That's definitely something out of the norm, why not wear it for Halloween? Not to mention, their hair style definitely suits the style. You can always add your personal touch to this to make yourself stand out. There is nothing more awesome than a classic. A nice crop top, high waist pants, platform heels, hoop earrings and extra bangles and necklaces. I've longed to emulate my favorite decade; The 70s. I have yet to see anyone dress in this notorious outfit that Halle wore at the 2000 MTV Movie Awards. It would be quite interesting to see someone actually pull this off. Side note: If you live in NYC you might want to thrown on a chic coat over this (unless you have the balls to walk around the cold in such an outfit than I say go for it). I think it is appropriate for every female posse to dress as The Spice Girls on Halloween. Their style is way too cool to not make a Halloween costume. Despite Lil Kim's raunchy lyrics matching her style, I've always loved it! I couldn't decide on which outfit I liked more because these both are my all-time favorites. If you don't dress like Lil Kim on the regular, it is absolutely appropriate to dress up as her on Halloween. These two outfits in particular are looks that I would love to see someone in this year! Can someone else other than Miley Cyrus pull this off? Absolutely!